Rhoda at Southern Hospitality is hosting a Before and After Projects Party! Go see check her out…lots of creative ideas! I get to meet her IRL at the Blissdom conference! Anyway, I had lots of projects over the year…but the one that can transform any room to make it look all cozy and co-hesive is the Lazy girl custom slipcover. I love white because you can yank those puppies right off, toss them in the wash with bleach and they are as good as new! I promise! So…if you’re a lazy girl and want to make your own slipcover…just click on here for the tutorial! Any one can do it! Kristi, that's right! YOU were the one with the really cool slipcover tutorial. Now I really need to get to know you! I've got a project just sitting here waiting for me to try to sew a slipcover. Got the fabric cheap (for $5) so I'm not too scared to try it out. Maybe you can give me more pointers at the conference. LOVE that pillow & it would be perfect in my guestroom. The initial is even good. 🙂 Thank you for playing along. Good job! And it looks great! Love the pillow. Looks Fabulous! I never knew there was a lazy girls version!! This is great…I was thinking of recovering our love seat and chair in the den…white…*smiles*Thank you! Oh I so love your slipcover!! Beautiful job! Thank you so much for the tutorial! It’s something I’ve been wanting to try for a long time but am so fearful of. You’ve inspired me. 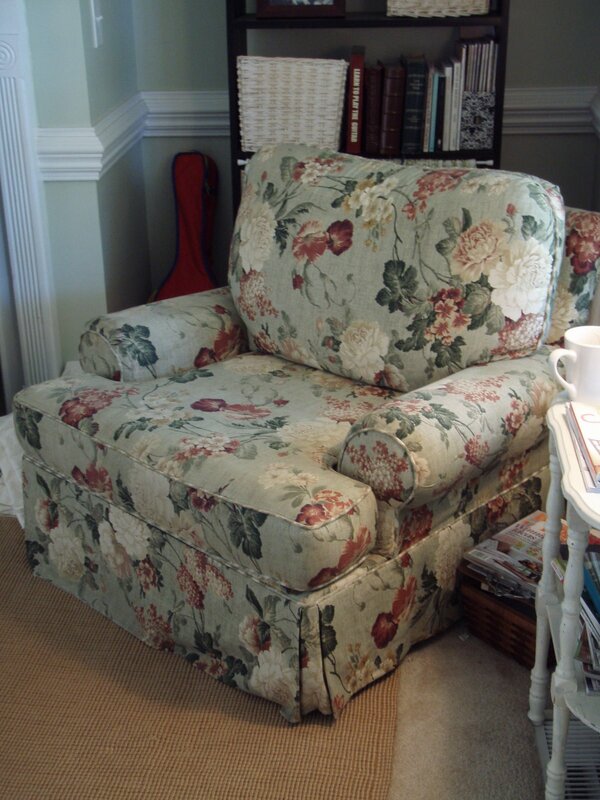 I have had this post bookmarked because I have the same style chair that needs slipcovered. I love the lamp redo in the previous post. I heart thrifting too! Beautiful slipcover, I will check out your lazy girl tutorial as I am embarking on a major slipcover adventure at my home! Thanks for the inspirational! 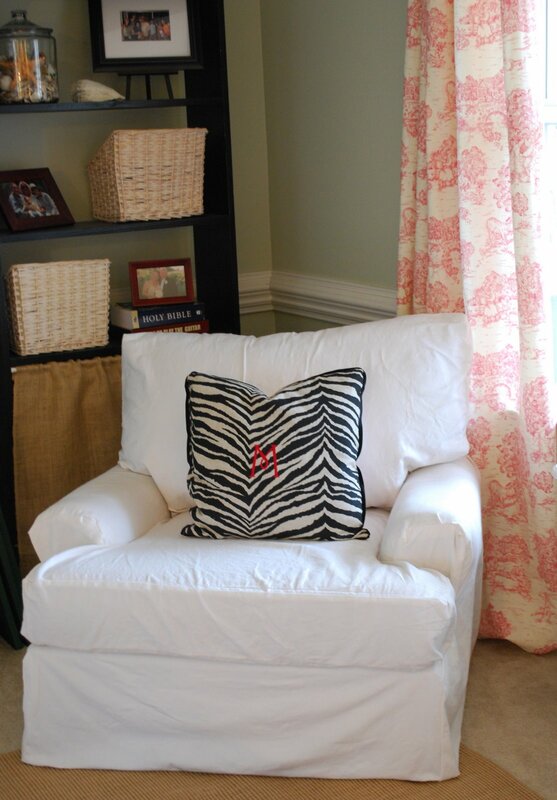 I love the slipcover and monogram looks great! I am here today by way fo Rhoda’s Before and After. Come and check out my projects if you get a chance. I am so impressed with your slipcover. I have a chair in need of one. Maybe I will attempt to try. I’ve got a chair exactly like that, but I’m too afraid to do this. You make it seem so easy! P.S. I’m madly in love with your house!! ok – I love the chair both ways! love the pink toile too – you did it yourself? I’m in awe – come to my house, please!!!!! it looks fantastic! have fun with your d60 and thanks for visiting us. I’m glad you posted this again because it is on my list of to-do’s and I was just thinking I needed to find your tutorial again! I hope to tackle it sometime this month! You make it look so easy and it’s exactly what I want my chair to look like. The TLC show Home Made Simple was in our home this week shooting an episode (so fun!) and I want to slipcover a chair to finish out the space they worked on! Then it will be the perfect cozy, happy place for me! That is awesome! What a great re-do. I'm dying at this! Reason is, I used to have that chair, gave it to an employee and then almost went out and bought a white one. DUH! I guess I was young and stupid. Oh the things I have given away that I could have refinished or sold on craigslist. Lesson learned. Great job! !